Our service technicians routinely check the water quality and service the filtration equipment. 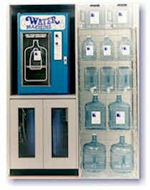 In addition, we also post at the dispensers, third party water analysis test results. If you have any questions, please contact us. Our friendly, professional staff is eager to help!